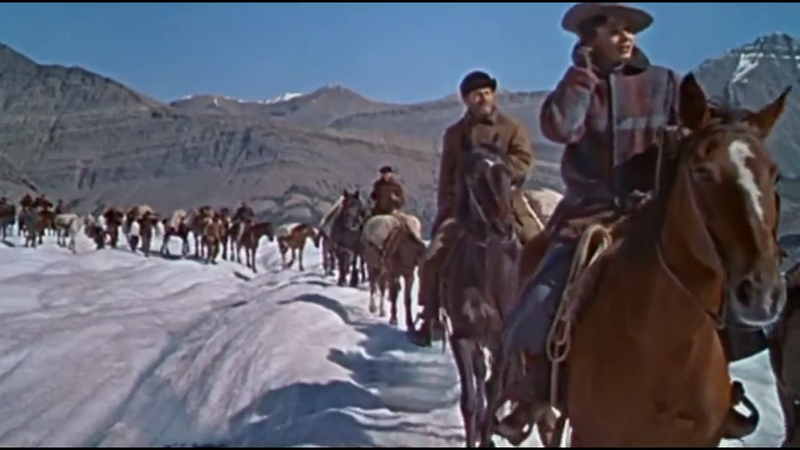 A cattle-driver (Jimmy Stewart) hoping to earn money by selling his herd in the Yukon is arrested for murdering two employees who tried to steal his cows, and sentenced to loss of his animals by a Seattle-area judge (John McIntire). 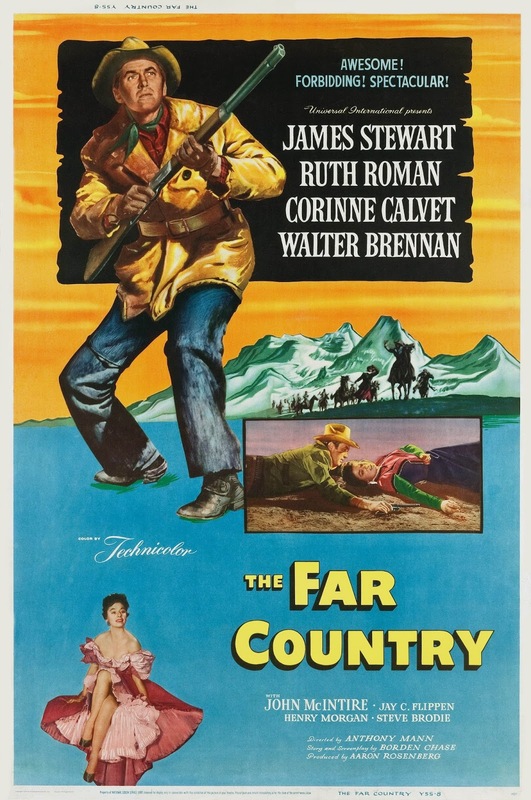 After agreeing to accompany a savvy saloon owner (Ruth Roman) on her trip to set up a new business in a frontier town, he steals his cattle back and takes them along, supported by his long-time buddy (Walter Brennan) and a young French-Canadian (Corinne Calvert) with a crush on Stewart. But McIntire refuses to back down without a fight, and swears he’ll punish Stewart once he’s back on American soil. 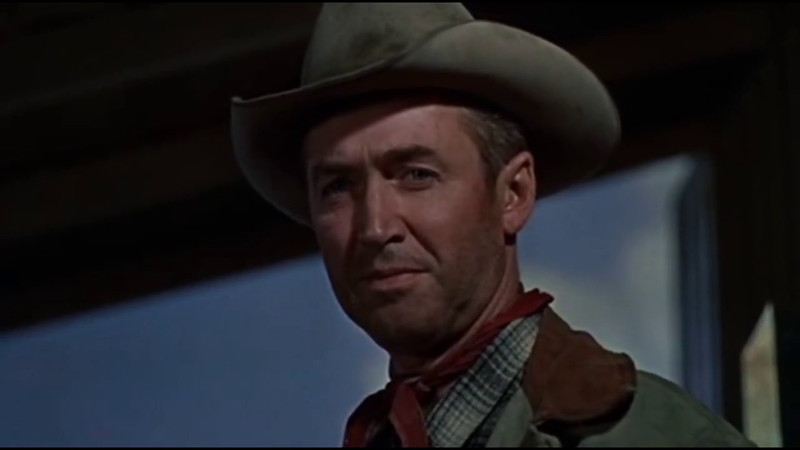 Peary writes that this “fourth in the five-film Anthony Mann-James Stewart western series” “has many elements of the other entries — a hero with a shady past, a revenge motif, strong violence, a beautiful but rugged landscape — but it’s weaker than the others”. He notes that “most significantly, it lacks the typical Mann-Stewart antagonist who represents Stewart’s alter ego, someone with a similar background who is the character Stewart would become if he didn’t reform”. He adds that “Stewart’s character is neither interesting nor appealing”, and “neither are the two women who love him: good-bad girl Roman and tomboy Corinne Calvert, who’s too sweet and innocent for a Mann film”. Finally, he notes that “the romantic scenes are trite, [and] the action scenes are unwieldy”. I’m in agreement with some of Peary’s assessment — particularly re: Calvert’s out-of-place portrayal as a young Francophone woman prone to petulantly asserting her maturity: “I’m NOT a freckle face. I’m a woman!” However, I actually find Roman’s business-woman “Ronda Castle” quite interesting: she’s a refreshingly strong-willed, independent, boldly sexual counterpart for Stewart, and effectively serves as his “antagonist”. She helps to flesh out the story’s focus on entrepeneurial grit — mixed with plenty of corruption, greed, and violence — in early mining towns. No, though it’s certainly worth a look for its historical relevance. First viewing. A once-must for its solid, complex storytelling (esp. as it relates to American history). This is another winner in the Stewart-Mann partnership – just as strong as screenwriter Borden Chase’s ‘Winchester ’73’ and ‘Bend of the River’. I’m a little confused by what Peary takes issue with here. From his POV, you would think that he would want *every* Anthony Mann western to be exactly the same, like a cookie-cutter product. Wouldn’t that get boring? Why would other such films be necessary if every element fell in line perfectly with what was done previously? The biggest surprise in the cast is John McIntire. Mainly known as a dependable, sort-of background supporting character without all that wide a range, McIntire makes an unexpected leap forward here as the relentlessly slimy Gannon – all the more insidious because he remains almost completely calm throughout his reign of greedy terror. SPOILER ALERT: My only qualm with the film came early on. As soon as Brennan started explaining about how he and Stewart were going to eventually settle down on a farm in Utah, I knew his character wasn’t going to survive the story. …But that’s a minor reservation re: a rather sturdy tale.